This might help in the IDLE NO MORE discussion. Chief Stan Louttit and John Cutfeet were part of a forum at U of Toronto on northern development. They talk about Attawapiskat and how the De Beers agreement was a bad deal. REVENUE SHARING is the key – as promised in the treaty rights. Let’s get it right Canada. This is a segment from my Urban Aboriginal show – Ep. 9. 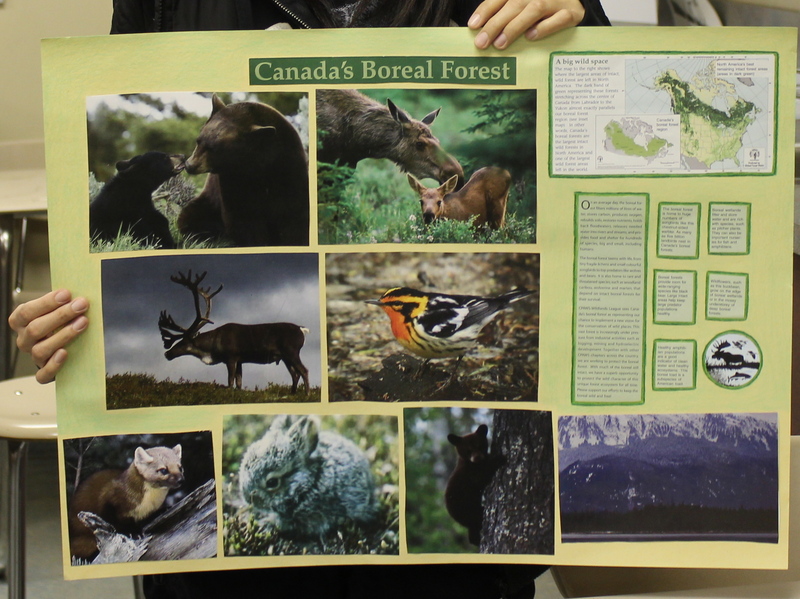 PROJECT SUGGESTION: “Canadian Boreal Forest Initiative”- The Boreal is the largest intact eco system in the world. 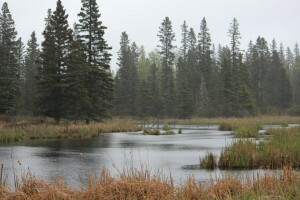 Sustainable development practices in Canada’s great northern forest are crucial to its survival. 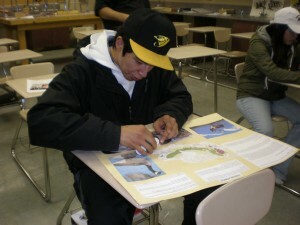 See story from Urban Aboriginal TV series. Learn how you can use media to get your message across with special events and a variety of multi-media platforms including social media. 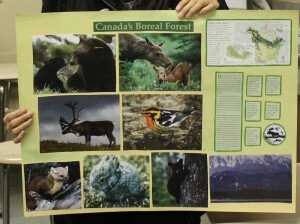 Suggestion: Have students do an internet research project on the Boreal. 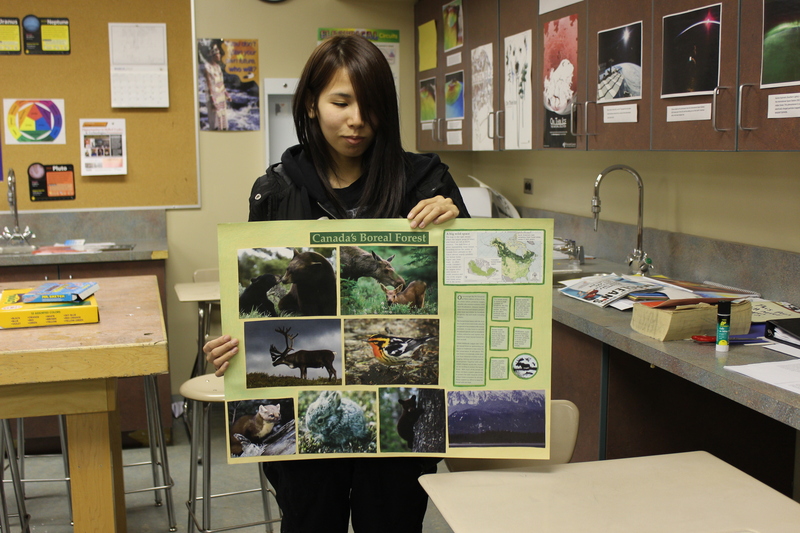 Create display boards with information and visuals on the Boreal – protection of the trees, the water, the animals, and the people who live there. Understand the impact of industrial development. I did this with a high school group in Kasabonika Lake First Nation. Next step is to have students create a video project about what they learn. Highschool students at Chief Simeon Mckay Education Centre, Kasabonika Lake First Nation, ON working on Boreal forest project. 2012. See my blog page for more details about my visit to Kasabonika. You may have heard about conservation efforts to save the rain forests of South America or perhaps the northern Boreal Forest. 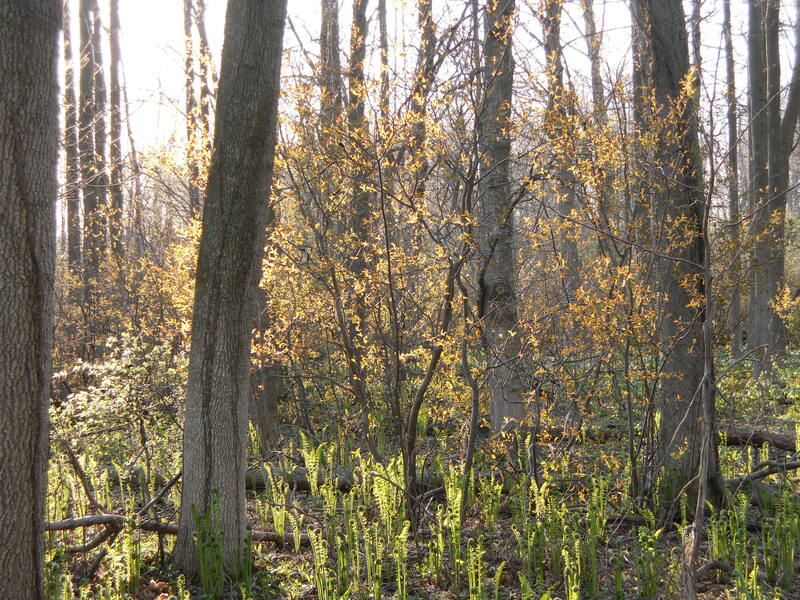 But did you know that Southern Ontario has a unique eco system called the Carolinian Forest? 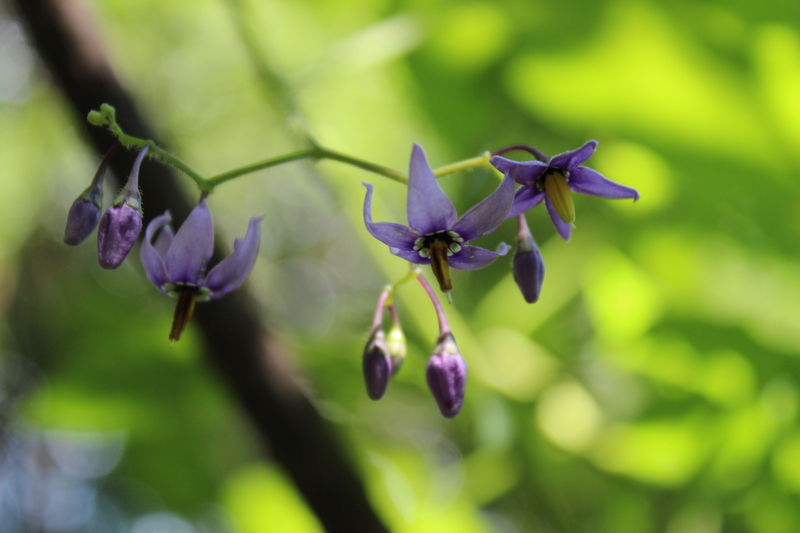 This forest habitat is home to some of the rarest species of plants and animals found anywhere in Canada. But 90% of the original Carolinian forest of Southern Ontario is gone . . .
– cleared by centuries of farming, industrial development and urban expansion. 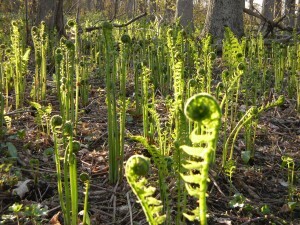 As a result, many of those species of plants and animals are now under threat or have gone extinct from Ontario. Do You Live in the Carolinian Life Zone? While in reality, the boundaries of the Carolinian Region are fuzzy, this map of EcoRegion 7E roughly corresponds with the Carolinian Life Zone. Take a tour of this wonderful place, as I did. This video is not just a series of pretty pictures (and fabulous music). 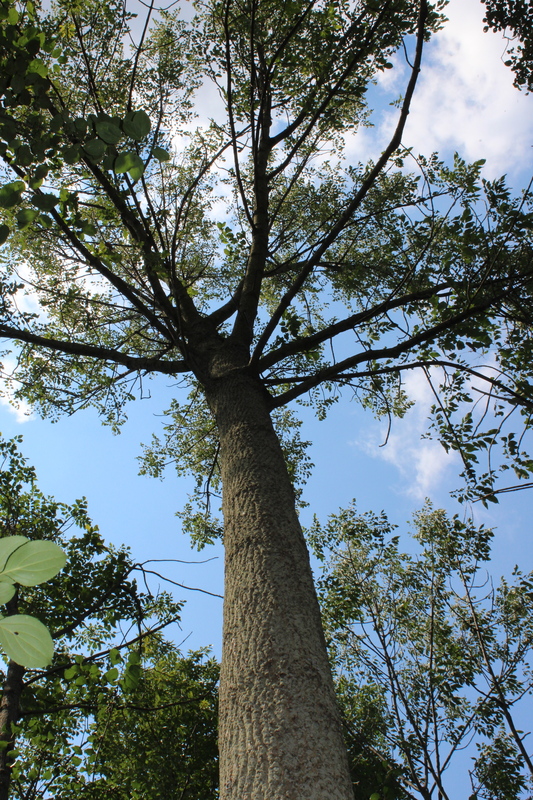 It is also a documentation of the many amazing species of plants and trees that can be found in this Carolinian wetland preserve. See how many you can identify! 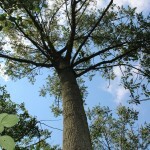 (Walnut trees, chestnuts, shag bark hickory and more …wild flowers, berries, . . . Poison Ivy anyone??? 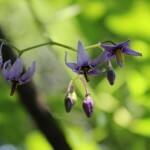 It is usually recognized as a three leafed green plant growing low to the ground, often in large patches. 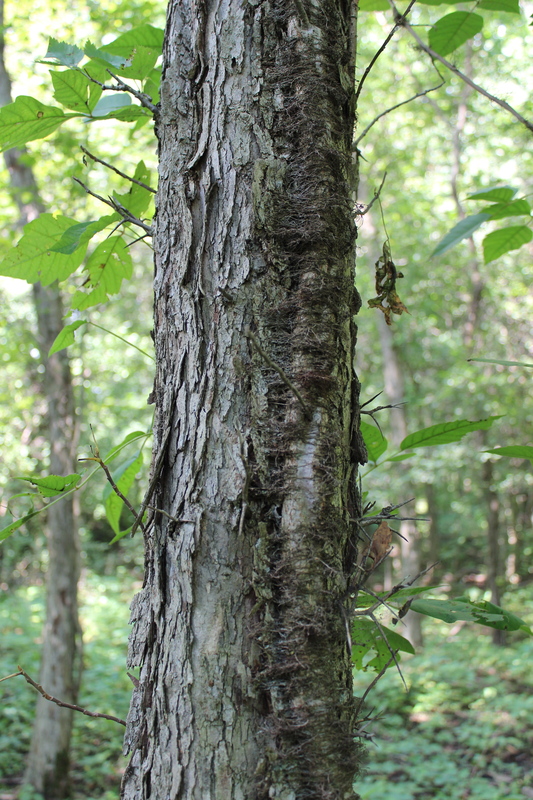 But look for the photo where the poison ivy has grown up the tree trunk and has formed a trick grey woody vine attaching itself by fine tentacles to the tree trunk. A clever camouflage indeed! A Day at Mud Lake ( a Carolinian eco tour) …. Click to view video. 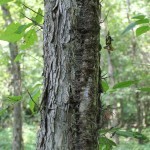 Poison Ivy climbs a tree trunk. BACKGROUND to the video: I was raised on a farm across the road from Mud Lake and I have many fond memories of spending time there as I was growing up during the 1960s and 70s. I was very pleased to be able to visit the property again this past summer. The owners, Don & Ruth Bucknell gave me a tour and nature talk about the plants and trees on the property. See how many you can identify as you view the video. “A Day at Mud Lake” is a video slideshow of the photographs I took on a walk with Don and Ruth Bucknell around their property on August 19, 2013. The images are set to music arranged by Brandon Besharah. Where is Mud Lake? The property is located in South-West Oxford Township, Oxford County, in south-western Ontario. 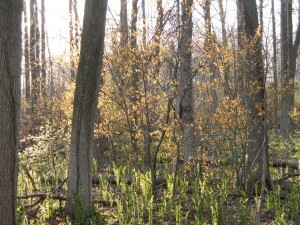 This is a unique part of Canada that is on the northern edge of the Carolinian eco zone – that is the eastern woodland forest of the United States that extends up into the southern part of Ontario along the Lake Erie shoreline and between Lake Ontario to the east and Lake Huron to the west. Note: You can locate Mud Lake on the map link for the Carolinian Life Zone, provided above.. Zoom in till you see McBeath Road, which runs west off of the Culloden Road, – just south of the town of Ingersoll and the 401 Hwy. Mud Lake is on the south side of McBeath Road. If you switch to the satellite view, you will see the extent of the wetlands surrounding the Lake. 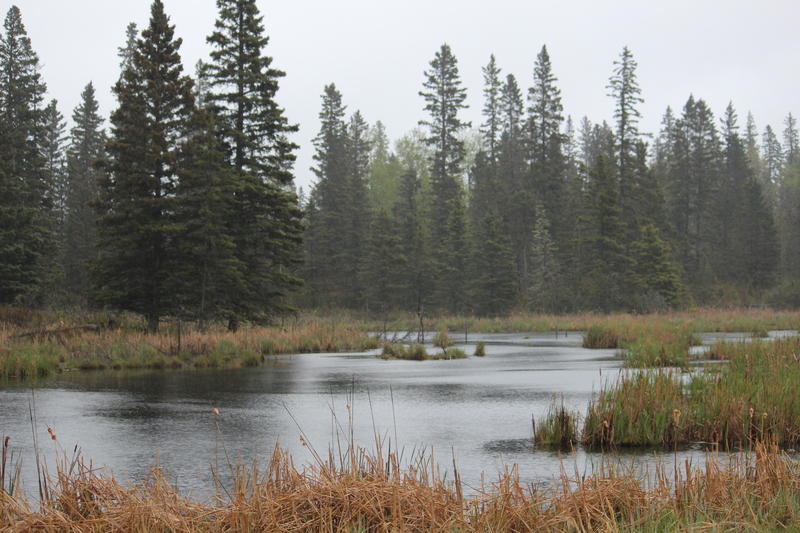 This property, which is owned by Don & Ruth Bucknell, has been protected as a natural wetland and forest reserve for over 50 years and will continue to enjoy permanent protection under the auspicious of The Nature Conservancy of Canada. MEDIA PROJECT IDEA: Have your students do a nature walk with digital cameras or smart phones. Ask them to photograph as many plants and trees as they can find. Instruct them to photograph each plant more than once, taking broad shots of the whole plant or tree and then closeups of features of the plants ( ie. bark, leaves, berries). Back in the classroom, they can use photo edit programs such as iPhoto to create their own slide show presentations, accompanied by their chose of music, as provided in the photo editing program, or upload their own favourite songs. All this should be edited with attention to timing to music and creative and visual style choices. My video was done using the “Ken Burns” slide option style in iPhoto. I like it because it creates a captivating sense of motion because the images are constantly changing direction and dissolving into the next. You can set the time for each slide to appear (I chose 5 seconds). Have the students research the plants they have photographed and have them prepare brief descriptions of the plants, and note any special characteristics of the plant they found of interest, ie. the way it grows, or its medicinal use for instance. Can you eat it or is it poisonous? There are many nature websites and books on the Carolinian eco zone. So this can be a exercise in internet and library research. 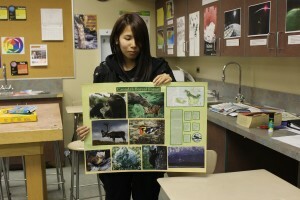 Finally, have the students present their videos to the class and talk about what they learned from the project. You can also create Carolinian displays in your hallway showcases that feature photographs and information on the Carolinian zone, and of you can, include a few video screens or laptops with a selection of your videos on constant play for all the school to enjoy.